Every 3 months we have a consultation with T's key person at nursery and run through all the EYFS key stages progress, as part of this they give us some ideas for areas we can work on in the forthcoming months, one of those areas was T learning his colours and shapes. Although he's been colour-matching from a very young age, he does get his colours mixed up still and by the next assesment should know them. So for us, March so far as been our 'rainbow month' where we've been doing lots of colour and shape associated activities. 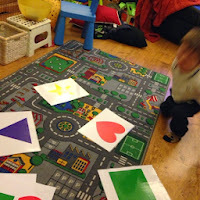 I came up with this little game as I think it leads to so many possibilties as T grows and can be played alone or with other children. So basically, I created some A4 sheets, each with a different coloured shape on, I printed 2 copies of each and laminated 1 set. I gave T the laminated set and asked him to lay them out on the floor (excuse the mess in the photo's!!!!) 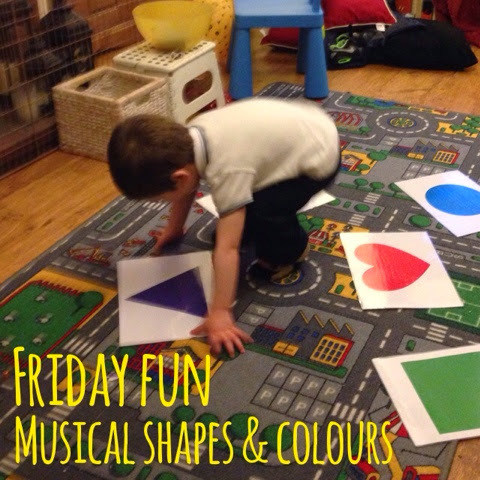 I put on some music that he likes to dance to, I told him that when I stop the music I will shout a colour or a shape and hold up the mat I want him to stand on, if he gets it right he hands the card to me. So cue T throwing some serious shapes on the 'dance floor' and me stopping the music and holding up my paper sheet shouting 'Yellow', then 'Heart' etc you get my point! The game is over when all cards have been handed over. I thought that he'd soon get bored of this, but if I heard 'do it again please Mummy' once, I heard it 10 times and so, on and on we went. 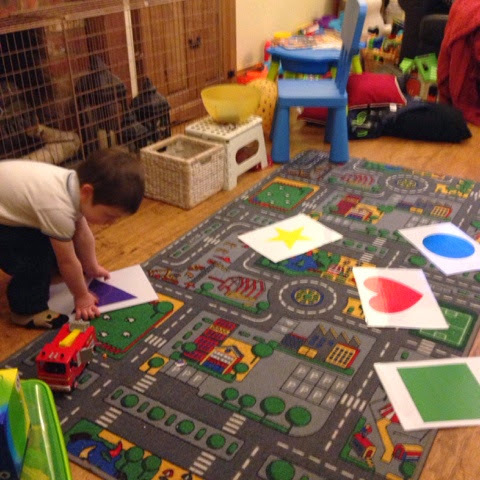 I think he's already at the stage where I can drop the paper set of cards and just call out the colour and/or shape. The game can also be enhanced as the child grows to add additional colours and shapes or different actions eg 'touch your nose when standing on the purple triangle'. 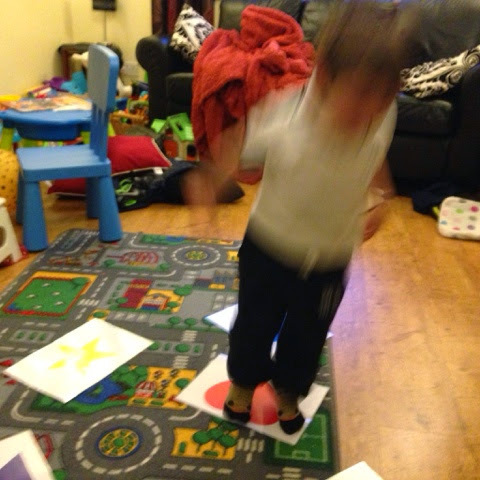 If you had enough mats and children it could be adapted to a 'musical chairs' game. A really simple game that can be easily created at home - even by the child themselves with paper and crayons. I'm sure this one will be hanging around our house for a long time! If you'd like to have a go at this yourself, to save you time, here's a .pdf I've created to enable you to print off the mats for yourself. Please note that I am not looking for any artistic or design awards for these, they are very simple and not perfect but they will save you a little bit of time!